General Plastics’ LAST-A-FOAM® has been engineered to provide a structural backing for solar panels. It provides long-term durability, structural strength and rigidity for optical clarity of solar panels. The strength-to-weight ratio makes LAST-A-FOAM® ideal for solar panel installation. 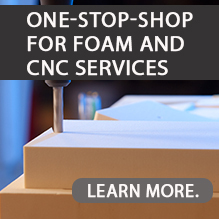 Our rigid polyurethane foam material is available as sheet stock or CNC-machined panels custom-sized to your specifications. Services include CNC machining of custom panels and complete panel assembly.